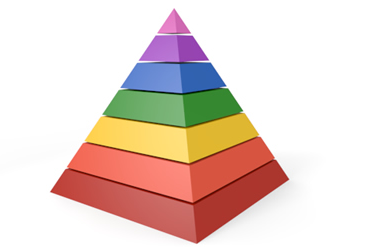 As the name indicates, pyramid scheme is structured like a pyramid with the initial recruiter on the top of the pyramid. Initial recruiter recruits a second person who needs to invest certain amount to get enrolled. Out of the enrolled money a fixed percentage will be paid to the initial recruiter for having one investor under him. Now the second person will be eligible for commission or will get back his money by recruiting more investors under him. Each investor recruited by second person is also required to invest. Now the new recruiters are required to find investors to get their money back or to earn profit. In this way, the base of the pyramid will gradually increase with number of investors to feed the upper structure. These type of pyramid schemes will not go on forever as no wealth has been created, noting has been sold, no one has rendered any services and no investments has been made. Pyramid will break when it becomes impossible for the investors at the bottom to recruit more number of investors to feed the upper structure. Pyramid scheme is generally initiated with an offer of guaranteed extraordinary high returns to new investors. To get rich quick, new investors will start investing in it and end up losing their investments but promoters at the top of the pyramid will make their money with the recruitment of new investors. This means, investors at the bottom of the pyramid are essentially defrauded by those on the top. Ponzi scheme is different from pyramid scheme. In Ponzi scheme, one person collects money from all investors and out of the money collected from the new investors they pay to old active investors. In such type of schemes they will not tell investors how their returns will be generated. We urge you to do your own research and talk to a professional before getting into such type of fraud scheme.